It was still dark as I paid the milkman when he disturbed me loading the car. Despite my back playing up I was making the most of the dry start to get to the lake before the rain materialised. This time I was going to use the barrow to cart my gear along the bank. By the time I was half a mile from the turning the rain commenced. Damn. It was only light so I wasn't too bothered as I strapped my gear to the barrow and set off. At first all went well, the barrow rolling along nicely and my back feeling no pressure. Then the terrain changed. Having made an early start, and planning a longer than usual session, I changed my approach. First of all I spodded out some hemp and pellets to a spot I was going to fish two baits over. Then I swapped one of the maggot feeders and the method feeder for small cage feeders. All three rods were now on The Rig meaning I could swap from open end or cage feeder to blockend on each rod as the fancy took me. My thinking being that a mix of crumb, hemp, pellet and Hemp and Hali Crush might have more drawing power than maggots alone. One cage feeder would be whacked right out then the other two rods would swap over now and then to put down a mix of feed and maggots over the spodded bait. The plan was a dead cert. There had been another angler unloading his car when I pulled into the car park who I saw heading off when the rain had eased about an hour after I had got settled in. Maybe he got called away on an emergency, or perhaps he'd had enough. When it comes to catching 'silvers' I get the impression all 'pleasure anglers' want is for bites to come every five minutes so they end up with a net of 20 or 30lb of small fish. They don't seem to want it to be a challenge of any sort. Set up like they always do, fish like they always do, catch a netful and go home. No wonder the muddy puddle fisheries are thriving. The trouble is the mentality that makes them a success is in danger of driving angling clubs to stock their stillwaters in the same way. There's a danger that if a stillwater isn't a big carp fishery it'll be an overstocked match type water. I guess that's giving people what they want by majority vote. Or catering to the lowest common denominator, depending on your point of view. As things turned out the rain didn't materialise. The promised strong wind did, though. This didn't bother me as I'd anticipated it and set up so it was blowing off my back. For once I left my brolly up when the rain stopped so as to keep the cool wind off me. I was wishing I hadn't forgotten the photography magazine I'd meant to put in the rucksack when nothing happened for a few hours. That went out of my mind when the right hand alarm sounded accompanied by the zizzing of the baitrunner. I wasn't sure what had given me a run like that to the bait on the long cast. As things turned out it was a roach. A success for the cage feeder. That idea had some merit. Trying to find a cage feeder to suit my taste had proved problematic. I'd given the ones I use for liquidised bread on the rivers some consideration. They're the right weight but a bit too big (left hand feeder below). A trip to my local tackle shop revealed ones that were either the right weight but too big or too small, or the right size but too heavy or light. I settled for the right size but too heavy (far right below) from Fox's Matrix range. 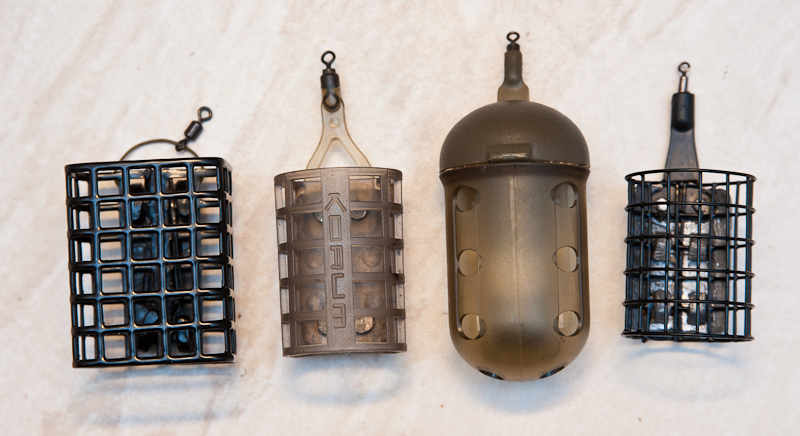 What I wanted was something the same weight and similar size to my favoured maggot feeders (second from right). Although the 40g feeders worked okay I wasn't happy and took a trip to Preston this morning in search of perfection. I didn't find it, but I think I got closer with a Korum job (second from right) that I'll be trying next time out. That fish didn't signal a feeding spell. The afternoon blew past quickly. The grey sky bringing dusk earlier than I thought it would. With the light failing the alarm sounded again on the distance rod and again the baitrunner spun. I was back to scratching my head as to why nothing was hooked. The rig went back out and the other cage feeder was wound in, filled, and hurled out alongside the right hand one. Two bites at range, even if they had been hours apart, must mean something. Ten minutes on and the far right bobbin is twitching. This time I felt a fish thump before it fell off. Things were returning to normal! 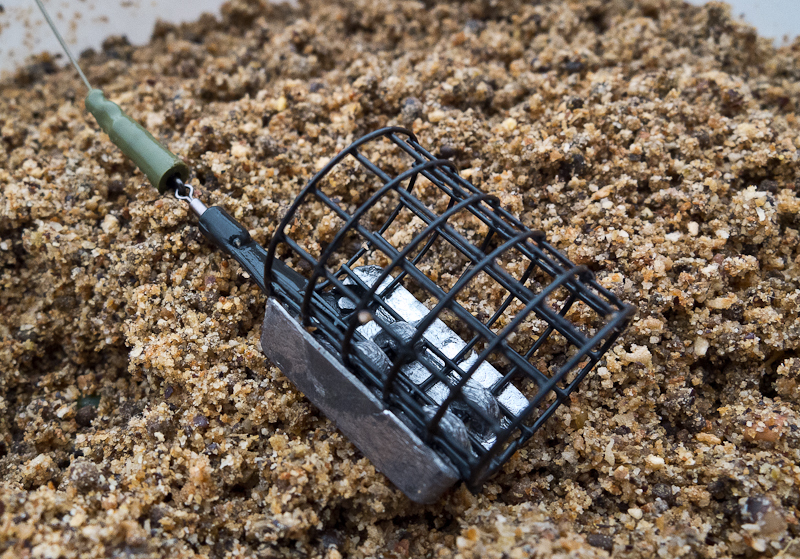 Why is it that carefully planned tactics (spodding out bait and recasting feeders regularly) fail when a randomly cast bait produces all the action? I'll never understand fishing. The barrow was readied. I took my time tidying my gear and loading the barrow for the journey back to the car. It was well dark when I reluctantly wound the last rod in and bungeed the quiver to the barrow. No doubt if the winter hadn't been so bloody wet the barrow would have been useful, but given the amount of water in the ground I was struggling to push the damned thing through what seemed like a swamp. I'd had to stop three times before I got to the swim and the return trip was no better. Next time it'll be back to carrying everything, even if it means making two trips. This getting old business is no joke. Looking on the bright side I thought back to the time Pete Hesketh and I took a short cut round a Cumbrian lake at the start of a pike session. Wearing thigh waders, loaded up with rod holdalls and rucksacks, carrying cool boxes in one hand and (cough) bait buckets in the other we set off through a thick lakeside wood. We'd never taken the route before and it was an hour before dawn on a cold winter's morning. Pete lead the way, or rather his spaniels did, with me carefully following in his footsteps. The dogs were running ahead then coming back to their master all the time when suddenly Pete shrank. He'd sunk to his knees in some boggy ground. Then the weight of his rucksack pulled him back in slow motion, his rod holdall pinning him down across his chest. I warily approached, not wanting to suffer the same fate. Pete commenced struggling like an upturned tortoise with a rucksack for a shell. His pathetically flailing arms were comical enough as he lay stranded, but two springers had come to rescue their master by running around and over him. I wanted to offer assistance. Honest I did. But I was now almost as helpless as he was - with laughter! Without sounding weird, I must say that I, and many others, really enjoy your blog. ...a good mix of amusing, informative, weird and off topic posts. Have found and read Lumbland. Bloody excellent it is too. Had me in stitches. Excellent blog this... And anybody who likes Goldfrapp has to be ok. I really do enjoy your Lumbland blog some real good tips on there and funny too. Egrets one minute, Atkinson Grimshaw the next. I'm addicted. Keep on writing, Dave - I for one really appreciate reading your blog. Your humour is unique and often has me chuckling to myself - on and off the river banks. Keep it going, Dave, it really is a great read and I know a lot of anglers who read it and enjoy it also. Fishing blogs may come and go, but this one remains consistently superb. I have just discovered Lumbland! Your musings are wonderful, Dave - your blog will keep me merrily reading for quite some time- excellent and thanks. I have been following your blog for some time now and thoroughly enjoy it. Great photos and a nice line in wit! "I don't like work - no man does - but I like what is in the work - the chance to find yourself. Your own reality - for yourself, not for others - what no other man can ever know. They can only see the mere show, and never can tell what it really means."